Many thanks Aimee Lewis, this is Ben Dirs for a bit. Here's Westwood of Worksop on tee at the par-three 12th. Lee is one over today and +3 overall. That's a corker, chance to get back to level for his round. Nice to see Rickie Fowler playing better today, he's covered the first seven holes in two under. The fat lady is not yet singing, this tournament is not yet over but this live text is. Thank you for a dozen hours of company, hundreds and hundreds of tweets. Please come back tomorrow at around 14:00 BST but check the tee times when they are published and we will be live for the start of play. Those tee times will be on our website when they are published so keep an eye out. For now, good night. Try not to have any nightmares about the 11th hole. His second day's play was exemplary, headline grabbing and pretty flawless. It's made more impressive as it follows a day where he was exactly the same. Jordan Spieth may be threatening our weekend enjoyment as he decimates this course but one man who will be overjoyed at how this tournament is going is Mark O'Meara on four under. The 1998 Masters and Open champion made the cut for the first time since 2005. Is Spieth playing a different sport? "I made a couple of silly mistakes but those things happen,"
said Europe's Ryder Cup captain. "I don't know what golf course Jordan Spieth is playing but it is not the same one I am playing. Just wow." Where can you lose this Masters? The 11th hole is a place of trouble for many. This is the long par four drag where many opt to play their second shot right of the green, thus avoiding water trouble. It is the hardest hole on the course over two days, giving up just six birdies. It takes an average 4.46 strokes and has claimed 56 double bogeys. Justin Rose, who shot a two under 70 and is seven under for the tournament: "I was not really enjoying myself in the first two holes. It was a tricky start but I just tried to remember a couple of other rounds here and I think it was in 2007 when I got off to a poor start in the final round and went on a run so I was just trying to create momentum. I had to just forget what had happened and remember yesterday's performance. Charley Hoffman speaking to BBC Sport: "I drove it a lot better, gave myself opportunities, missed a couple coming in but really happy with how I played. "We've only played 36 and we've got 36 more so there's a lot of golf to go. You can make a lot of birdies out there and hopefully I'm there coming down the back nine on Sunday." The 2001 Open champion and twice Masters runner-up David Duval seems very much of a mind this tournament is now a two-horse race. "Heck of a battle going on for third right now,"
he tweets. "If Jordan posts 143/144 for the weekend can anyone other than Hoffman catch up? The biggest battle moving forward this weekend for Jordan will be in his own mind. Got to stay present." "He has possibly played the best 36 holes in a Major championship ever. "Today particularly there was more wind about and the pins were tougher. To shoot 130 over 36 holes excellent, almost more so because he is 21. "Total quality. His putting has been of the highest quality." Wow. Reflection time. A marathon day with one man just streaking clear, oblivious to the pack. Is this the tournament where Jordan Spieth becomes a household name to those perhaps not golf mad? Is he getting worse though as the week goes on? The 21-year-old found 13 greens from 18 today, two fewer than yesterday. His driving also tailed off as he landed nine of 14 fairways rather than the 11 of Thursday. World number one Rory McIlroy: "I find myself 12 back and I needed to have a good back nine to be here. I have been able to salvage something from the day which is the only good thing I can take from it. "I hope I can find another gear. It's hard to know when it is going to come. Jordan obviously has it this week. It is going to take two phenomenal rounds for me and some average rounds for some other guys in the field for it to happen." "I don't want to wish bad on anyone but..."
South African Els, who is nine shots behind Spieth, said: "Jordan is playing unbelievably well and obviously we're all watching the leaderboard. But we know how far there is to go. "Front runners tend to do well here, but there have been some really good comebacks, so it's a big weekend ahead." The two-time Open champion added: "I'd really like to shoot two 67s and see where that leaves me. "If it keeps blowing like this and the nerves get going... I don't want to wish badly on anyone but if he takes his foot off the gas or has a bad break here and there, it really gives you thought of catching him." Paul Casey is seven under and has been speaking to BBC Sport: "I've holed out extremely well over the two days, the key to keeping me in contention, though I'm not sure seven back is. "If you told me the beginning of the week seven under would be seven back I wouldn't have believed you. I never though this course would yield 14 under. That's phenomenal golfing. Really it's a two horse race as it looks right now. They keep ploughing ahead like that we are playing for third or fourth." Well, it looks like it's Jordan Spieth's Masters - the 21-year-old from Dallas is five clear of the field and playing some special golf. However, the leaderboard is looking far more interesting than it did a couple of hours ago and if Spieth goes level par on Saturday and a couple below him fire rounds in the mid-60s, it's all on again. Tom Watson: Rough day, I tried to hit the driver too hard...too many pull hooks. This and some poor putting and I am not playing the weekend. Next Year! Watson finished nine over on day two and eight over overall to miss the cut. Ian Poulter: This game is certainly won and lost on the putting green. Obviously I need to work harder. No excuses just plane old grit & determination. Level par for the day, Poulter is one over overall. Only three men still out on the course, Holmes, Snedeker and Kaymer. Twenty-eight players under par, the cut line is two over. Players to miss out on the weekend include England's Luke Donald, Ireland's Padraig Harrington, Frenchman Victor Dubuisson, Germany's Martin Kaymer and former champion Trevor Immelman. "Can McIlroy come from 12 back? He could but I don't think he will because of the guy who is out in front. Let's not forget, this guy won once and came second twice coming into this tournament." McIlroy over the hill at 40? "Professional golfers in general have a pet peeve. If you make a bogey and make a birdie, you don't get it back. The bogey still stands. McIlroy played himself into a better position than he was, but the 40 opening nine still stands. "I'm going to throw something out there. In 1997, Tiger Woods shot a 40 on one nine when he won." "He looked finished at the halfway stage in this round, now he has clawed himself back." Mickelson has got plenty of work to do to make par at the last, slippery long-ranger down the hill... beautiful, just a feather, finishes a couple of feet left. McIlroy for birdie and a round of 71 - he's 12 behind but it could have been a whole lot worse, having gone out in 40. Moore makes his four-footer for a six-under 66, joint lowest of the day, and four under overall. Mickelson is six under after a 68, eight off the lead but still in it. Lizzy Dixon: My ex-boyfriend introduced me to golf last year. Now, I'm listening to it on my own and loving it. Poor Rory. Up at 18, Schwartzel squirts his downhill par putt past the hole, he'll card a 70 for three under overall. Mickelson with his second into 18, starting it out left and hitting it too far, his ball refusing to come back down the slope. McIlroy all over the pin with his approach, could be another birdie. Two-time Masters winner Ben Crenshaw, after playing his final tournament at Augusta, says on Sky Sports: "It [Augusta] has meant everything to me. There is no place like it and I am just thrilled I won two Masters and have been in a fight for a lot of them. People treat their champions here unbelievably. They make you feel welcome and I will never forget this day for the rest of my life. "It was so wonderful to see Carl Jackson (who has caddied for Ben Crenshaw 39 times at Augusta). He has had a health setback but he looks OK, he just needs to take it easy. Yesterday was a very humid day and it would have been tough on anyone. It was great to see his tall figure when I came off the green, I could not have done many things without him. He is a wonderful man and a wonderful friend." wants the water to avoid the course. McIlroy has chipped in at 17 - birdie, he's back into the red. Moore, too, rolls in his birdie, that's his third in a row and he's now four under. Mickelson, not to be outdone, also makes birdie, he's now six under and outright sixth. Ryan Moore into the 17th, his irons have been hot today. Mickelson has somehow flown his ball over a pine tree about six feet in front of him and parachuted in to within about six feet of the pin. No idea how he did that, but I'd sell my gran to know. Jamie Gillies: The best moment of the Masters so far was Ben Crenshaw and Carl Jackson at the end there, that's what sport is all about. Earlier we asked for you to vote on whether you think Jordan Spieth can be caught at The Masters and 57.7% of you say yes he can. Ryan Moore - apologies, I mixed him up with Palmer a moment ago - birdies 16 and is five under for his round and three under for the week. Casey's birdie putt at the last just misses - the Englishman cards a 68 for seven under and a tie for third. No bogeys today for Casey, and only one in the first two rounds. If you'd told him he'd do that beforehand, he might have thought he'd be leading. "The players are taking no time with their shots at all, they want to get it done because there is weather in the air. There are really dark, fearsome clouds gathering." McIlroy putting from the fringe and his birdie attempt breaks too soon. Taps in for par, stays level, 14 off the lead - he'll be here this weekend but his challenge is over. England's Danny Willett has made the cut - two 71s on his Masters debut, that's some golf from the Sheffield man. Mickelson with seven or eight iron off the tee at 16, that's not much cop. Ryan Moore very nearly sticks his tee shot in, McIlroy is right over the pin. Mickelson comes up well short with his second - greens playing slow this week - and he's got a lot of work to do to save par. Andrew Priestley: "Ben Crenshaw, what an absolute gentleman. In a sport filled with great people, Ben Crenshaw stands out. The gentleman's gentleman." Mickelson makes that birdie, he's now five under and tied for sixth with Ernie Els. That's always what's nice about a Masters leaderboard, the mixture of old and new and greats of the past, present and future. Four-time Masters winner Woods pointed to Australia's Greg Norman's collapse in 1996 when he lost a six-shot lead to England's Nick Faldo on the final day. Woods said: "I'm still right there. I'm 12 back, but there's not a lot of guys ahead of me. And with 36 holes here to go, anything can happen. 1996 proved that. "So we have a long way to go. There's so many holes to play and so many different things can happen. We don't know what the conditions are going to be"
Back at 15, here's Mickelson's chip... decent, should make a bird from there. Casey on 18... rasps one down the middle, that's a beauty. McIlroy for eagle on 15... great weight and he'll pop that in for birdie, he's back to level and two within the cut line. The almost unrecognisable Jason Dufner - he's done about 25lb in the last few months - will be here for the weekend, he's +1. Here's Crenshaw - go on, mate, stick it in... leaves it a shade left, taps it in, an era comes to an end. Enter Carl Jackson, his caddie since 1976 - big hugs, buckets of tears, chairman Billy Payne also makes an appearance. It's difficult to comprehend, really, what it must be like for so many years of Augusta memories to come to an end. Ian Poulter is one over for the tournament. "Great scenes at the 18th. Ben Crenshaw has just taken his cap from his silver hair and acknowledged brilliant scenes. Barely a dry eye in the house. A hugely popular figure in American golf." Here's Bren Crenshaw coming up the last for the final time. His caddie since 1976, Carl Jackson, awaits him behind the 18th green - he's been battling cancer of late so was too ill to carry Ben's bags this week, except in the par-three. There'll be a few tears shed this evening and a few beers shared before they head down Magnolia Lane and into Augusta history. Crenshaw with a fine pitch on, off comes the cap, the patrons rise, lovely stuff. Casey into the 17th and his ball just clings on. Here's Mickelson at 15, a five wood in his mitts, and he's tugged it long and left. That said, you'd back him to get up and down from there for birdie. McIlroy playing from bang middle and he's safely on in two. McIlroy takes out his frustrations on the tee at 15, he could do with an eagle here, just to get rid of the weekend jitters. Schwartzel of South Africa, winner when McIlroy melted down in 2011, birdies 15 and is four under. Par for Mickelson at 14 after some smart scrambling. That's poor from Rory, however, from no more than a few feet, he drops back to +1 and is flirting with the cut line once again. Casey lets rip at 17, great to see him finding some of that old magic. Old Ben Crenshaw is still poking it round there, he's got two more holes to go. Crenshaw made his Masters debut in 1972 and has won it twice, in 1984 and 1995. It's all a bit of a struggle nowadays, however, which is why it's his last appearance - he's 30 over but this course will never take his dignity. McIlroy from the first cut at 14, that's solid enough. Scott makes bogey five at the last for a 69 - but that leaves him 11 behind leader Spieth. Dustin for par at the last, from six feet... starts left and stays left. The big-hitting American is in with a 67 for seven under, third overall and seven off the lead. Three eagles in that round, seven under for the par fives, a Masters record. Stunning Spieth, smiling Tiger and Wayne Gretzky. Check out our BBC Sport Facebook gallery from day two of the Masters. Adam Scott, champion in 2013, birdies 17 and is now four under. Johnson with a cute chip over the bunker at 18, should make his par. Casey pulls his tee shot at 16, a lot of work to do from there. Scott has chipped into a bunker at 18 - clears his grooves, as if that was the problem. Mickelson preparing some magic, he needs to come up with a banana shot round the trees and into the 14th green. Par at the last for Rose, a round of 70, seven under and tied for fourth with fellow Englishman Paul Casey, who has just birdied 15. Bubba in with a 71 for two under overall. Dustin made par at 17 and here he is at 18... not good, he's dumped it in the jungle. Birdie at 13 for Mickelson, he's now -4, good to see Lefty finding a bit of form. Rory taps in for eagle, that takes him back to level and three inside the projected cut. Rose at 18, into the heart of the green, birdie chance. McIlroy at 13 after that monster drive and he's got no more than an eight iron in his mitts - corker, leaves himself a two-footer for eagle. Dustin's second into 17... looks like it's going to race through but suddenly grips on the fringe. Bill Haas going great guns, he's birdied 15 to get to -4. Bill's dad, Jay, finished third at the Masters behind Ben Crenshaw in 1995. Mickelson on tee at 13, he made birdie on 11 to get to -3. That's a pearler, a perfect left-handed fade around the corner. McIlroy flies the trees, doesn't even need to draw it. Rose on the 18th and he slams one down the right side of the fairway. Westwood in with a 73, he's two over and will be here for the next two days. Casey misses that birdie putt at 14 and leaves himself a tricky one coming back. Matsuyama, too, hits it too hard and will stay three under. Casey remains six under and eight off the lead. "That double bogey on the first must have rattled Dustin Johnson's cage. He must have decided he will have to free-wheel it and has just decided, having seen where Jordan Spieth is, he has to go for it and he is doing just that." Dustin has poured in another birdie from all of 40 feet up the hill at 16 to get to -8 and outright third. These late charges by a handful of players are in danger of making it an interesting weekend. Adam Scott of Australia made eagle at 15, also, he's three under for the week. Poulter snatches at his par putt on 18 and that makes it a level-par round. He'll be here for the weekend, he's +1, just inside the cut line. Rickie Fowler finished on the same score after a 72 of his own, Scotland's Stephen Gallacher is going home, however, he's +3 overall after a 76. "It is always difficult starting on your round when the leader is 14 under par and you are one under and you want some early birdies. If you don't get them you start forcing it. "He has got to get himself together. He is in danger of missing the cut which looks like being two over. He needs some birdies on the back nine." McIlroy on tee at the short 12th and he's overcooked another iron, he's got the strength of 10 men today and he doesn't even know it. Justin Rose makes birdie after that fine tee shot at 16, moves to seven under and into a tie for third with Dustin Johnson. Dustin Johnson makes it three eagles for his round with that tap-in at 15 - that's a Masters record and he already jointly holds the record for most in a Masters tournament, with four. He's now seven under and has more crystal goblets than John Lewis. Bill Haas moves back to -3 with birdie at 13, Rose gives himself another birdie chance at 16 courtesy of a magnificent tee shot. McIlroy's birdie putt at 11 comes up a revolution short, but here's Patrick Reed splashing in at the last for a birdie, a round of 72 and two under for the tournament. BBC Sport's Ian Singleton at Augusta: "The weather here is slightly breezier than we've seen this week. When the sun is out it is sweltering but it is having to battle intermittently with clouds. Thunderstorms have been forecast all week and there is talk about bad weather between 4pm and 6pm local time. We'll see." It is now 5:07pm local time. No sign of anything too bad. McIlroy's second at 11... that's OK, but nothing more than that. Dustin's second to 15, could do with another pair of crystal goblets here, and he's going to get them - almost an albatross, he'll be seven under in a minute. Two Englishman tied for third, Justin Rose and Paul Casey. But there is an ocean of rowing to do before they catch Jordan Spieth atop the leaderboard. Rose for birdie on 15... misses by a whisker, stays six under. Casey on tee at 13, fades when he wants to draw but that's OK.
Switch on to BBC Radio 5 live sports extra right now for the rest of the coverage of the second round of the Masters. Bishop Yinkus: Could Jordan Spieth be young Tiger Woods in disguise? N J Pedersen: Sunday will be Day's day. He just needs to take it one day at a time, seize the day and celebrate like its Australia Day. Rakesh Pradhan: Unless someone makes a charge Jordan Spieth could be getting measured up for the Green Jacket by the end of the day. Jordan Spieth is out there practising his putting, which is a bit like Michelangelo practising his drawing having just completed the Sistine Chapel. Westwood on tee at 16 and he's into the guts. McIlroy on tee at 11 and he's given it some hammer. Casey has moved to six under, the Englishman birdied 12, a 14-footer, and is now third. "What Rory needs to do is try and string a couple of shots together. He needs to get a bit lucky and get on a roll. "He is an emotional player, when things go his way they go his way in a big way, but when things don't go his way, can he dig himself out? That is the question we have to ask." Peach of a chip from Mickelson at 10, here's Dustin's second into 14, that's decent. McIlroy for birdie on 10 and he finally makes one to get back to +2 and inside the projected cut. Mickelson completes that up and down, stays -2. Poulter for birdie on 16 after a good tee shot and he bends it in to get back to level. Casey's birdie chip at 11 lips out and dribbles six feet down the hill. Rose makes a good save at 14, stays -6. Clubhouse leader Jordan Spieth: "I pretty much made everything that was in a decent range today. All in all it was two very similar days - putting the ball well and taking my chances. I felt the swing felt natural today and I'll keep working on it. "It will be somewhat challenging [not thinking about winning but I have to set a goal for myself. Charley Hoffman is playing solid golf so I certainly can't let up and the course will get tougher." Sergio Garcia is far from enthralled by his mark of two under. Not even four birdies in five holes to finish have cheered him up. The Spaniard - majorless of course - is among many on social media paying tribute to Jordan Spieth. Great up and down from Dustin at 13, he moves to five under. Today we're witnessing one of the key differences between Tiger Woods and Rory McIlroy - Tiger's body language never, ever suggests he's beaten, while Rory's sometimes suggests he'd rather be anywhere than struggling out on the course. Great second from McIlroy into 10, birdie chance - and he needs it. Dustin Johnson putting through the fringe at 13 and, not surprisingly, his ball has come up well short. Kevin Na has put together a pretty handy round today and here's another fine approach at 18 - make that putt and that's a round of 65. Schwartzel, winner in 2011, birdies 10 to get to four under. VB: Rory McIlroy has mentally got on the flight home. Hopefully everyone can shut up about a career slam and enjoy Spieth's masterclass. Blerghhhhhh: Come on then Justin Rose, strong finish please. Make a quiet night in worth it. "He has a stroppy walk as he comes to the 10th tee, he looks like he hates this place right now. It has messed with his brain, he can not handle it and it is all unravelling very quickly." Many thanks Luke, this is Ben Dirs until stumps. Here's McIlroy on tee at 10, he needs a good contact... he's given that some serious heave-ho with a three wood, his ball finishing just behind Ryan Moore, who hit driver. Disaster is staring Rory McIlroy right in the face. It is eyeballing him, laughing at him. He will putt from off the green for birdie on nine, doesn't get it. Doesn't get hold of the ball at all and leaves it in the fringe. Now here we go for par, it's a one in 10 chance putt, runs past. He has a knee-knocker from five feet for bogey. That will put him right on the cut. Ryan Moore is playing with him and nets a birdie to go one under overall. McIlroy for bogey... NO. He doubles and that is +3. This is how you handle the par fives, Justin Rose stands over a nasty four footer and downs it. His salmon shirt is not for me, but his par-five treatment is. Rose is now third in the 2015 Masters. "We have been watching Rory closely this morning and he has made some curious club selection and course management decisions. It doesn't make sense, some of the decisions made out there." "The top 50 players and those within ten shots of the leader will make it through, but because we have a runaway leader that takes the ten shot rule out of the equation. Two over par should be good enough to make the cut and Darren Clarke is there as we speak. "Rory is flirting with the cut mark at the moment, he has a share of 32nd place and he needed to dig in because things have not gone well for him. This is where champions dig in and make sure they put themselves in a position to have a big finish." Rory McIlroy pumps an iron at the ninth flag. He needs something, this isn't it. Through the green. Work to do to save par at +1. "It has been an amazing performance. Spieth has not done anything special, he took advantage of a break in the first round and today he just wore the golf course down. It was such an impressive performance coming on the heels of his 64. There is a saying that it is always tough to break 70 after a 65 and he blew it out of the water with a 66 today." "To Augusta for coverage of the Masters. Jordan Spieth has sparkled, leaving one of our team 'Spiethless'"
BBC Radio 5 live now for coverage. Rose to move to -6? Now then, can Justin Rose shed the shackles of five under on the birdie opportunity that is the par-five 13th? His second shot will be struck off a mix of pine and grass as his ball rests. He gets all of it to clear water but it's left of the green. Still chip-putt for your birdie Justin. Bogey for Poulter as he misses a tiddler on 14. Back to one over. We will no doubt hear from him on social media later. When Bobby Jones and Clifford Roberts first conceived the idea of Augusta National they envisaged a membership of around 1800 people with an entry fee of $350 and annual subs of $60. Actual membership levels are thought to be around 300. We have another player on four under - Kevin Streelman. A stunner of a third shot into 'Firethorn' - the 15th does nicely. It leaves a tap in for four and birdie. He joins Kevin Na and Dustin Johnson on four under. Rory McIlroy has a left-to-right putt from about 30 feet for a birdie on the par five eighth. Remember, last year he was chronic on the par fives, playing them to even par for the week, eight shots worse than winner Bubba Watson who ended eight clear of McIlroy. The putt is a nice read but not quite on the money and that is par. You have to nail the par fives here. Selected others: -3 Day (Aus) -2 Woods (US), Mickelson (US) 7 Garcia (Spa) -1 Willett (Eng) 17Level Poulter (Eng) 12, B Watson (US) 11 +1 McDowell (NI), Donaldson (Wal), Fowler (US) , McIlroy (NI) 7 +2 Clarke (NI) 16. "It is hard to see anyone catching Jordan Spieth but it is a long way to go. Strong finishes today for the likes of Paul Casey and Justin Rose can keep them in there." Justin RoseA great few minutes for British hopes as Justin Rose goes birdie on 11 and Paul Casey saves his par on nine. Both are five blows under par and nine off the lead. Right then, it is that time. Mark Chapman presents BBC Radio 5 live coverage of The Masters day two on the radio and online right now. Coverage will switch to BBC Radio 5 live sports extra at 22:00 BST. It is widely accepted that 15th and 16th century artist Michelangelo - who painted the Sistine Chapel - was left handed. Had he taken up golf, he'd probably love Augusta. BBC Sport's chief sports writer Tom Fordyce writes: "Established wisdom is that this is a course to suit the southpaws. Six holes feature a right to left dog-leg where left-handers can hit stock fade shots. Half the winners in the last 12 years have been lefties. "Equally, every champion in the first 66 years played right-handed." Paul Casey, the best Briton in the field as things stand, left side of the ninth fairway... he doesn't like it and so he shouldn't. He lets go of his club as the ball plunders into spectators to the right of the green. What can he conjure? Not a lot. Oh, hang on, a nice judge of a slope at the back of the green as his chip looks to run too far but comes back a little. Around 15 feet to stay at five under. Big Phil Mickelson on eight. The left-handed entertainer goes with fairway wood... smack. Right up there and a long eagle putt awaits. All aboard the bogey train. Justin Rose was all over the shop on 11 and cannot sink a long putt to save. Dustin Johnson suffers a similar fate on 10. That leaves Rose on four under, Johnson one further back. Could Rory miss the weekend? I'll put my head above the parapet and say it. Rory McIlroy could miss the cut. He gave a stroke away on seven and is a shot over par for the tournament. The cut is around two worse off. His tee shot on eight is not great. McIlroy is struggling. if you have just tuned in, Jordan Spieth has taken the record for a low score of 130 at the halfway stage of the Masters. He equalled the halfway mark for any major. Well done Paul Casey. A nasty four feet for par on eight well negotiated. He stays five under. Rory McIlroy will drop another stroke soon, his flirtation with trees on seven will not end well as he has a bogey putt. Ian Poulter is attacking a par five green... third shot... solid. Around 20 feet for birdie. And Justin Rose will likely give one back on 11. Like virtually every player he went right of the green with his second shot to the ugly par four. His chip doesn't hold on the green, a long one for par. And so to Charley Hoffman, Jordan Spieth's nearest challenger. He has a horrible, downhill, nightmarish putt on the 18th for par. It's probably 30 feet and while beautifully judged, will not drop. The 18th claims a key stroke. His only lost one of the day. Nine under, the lead is five. Spieth to "keep his head down"
Jordan Spieth is not getting carried away with his one-man crusade to the Green Jacket. He is 14 under, four clear of Charley Hoffman and nine clear of anyone else. All over? Spieth said: "I have been on my game and coming to a place that I love. It's special to be here and just be in the tournament let alone out front. "I just need to keep my head down, set a goal for myself. It's definitely going to be more challenging and I am going to have to be aware of that and be okay with a bogey or two." It is just not happening for Rory McIlroy. He is behind a tree on the par four seventh. His second shot will not be able to gain lofty trajectory, too many branches will see to that. He skittles one up towards the green but it is well short. A good up and down needed for par. Bubba Watson is ambling along. The champion has dropped a stroke today and is level par after 10. Feast or famine? Peak or trough? Hot or cold? It's the usual all or nothing for Bubba at Augusta. The man with two green jackets has had some very ordinary performances scattered around his two wins. Aside from victory, his best finish is tied for 20th. Did you know? Watson served a home-cooked meal at the Champions' Dinner, a recipe of his mother's or 'mom's' as they'd say in America. "That's what I'm about," he said when describing it, though he stopped short of saying what the dish was. He also didn't clear up whether his mother was the one cooking for all of the former champions or if she had passed her recipe on to a chef. Mike Devitt: Storms here in Cyprus. Rory McIlroy needs the weather to stay clear in Augusta or the slam is gone! Nathaniel Jansen: What size chest is Jordan Spieth? May as well pop round to the tailor's tonight and get that green jacket fitted. Jason Day, forever a bridesmaid at majors it seems, not quite on script with his read of the 18th green... par. Three under overall. The fight for leading Brit is between Justin Rose and Paul Casey, Rose has a nice birdie on 10. Wonderful putt from left to right. Rose has some dodgy sunglasses on but we won't be too hard on him. He joins Casey on five under. Sergio Garcia is in the clubhouse at two under, birdies on four of his last five holes. You can forget any move to 11 under. Hoffman pushes his tee shot on 18 into the trees and it's a deep walk into the woods for him. He will do well to save par. Jordan Spieth just did a little fist pump somewhere. This is looking more and more like his weekend. Charley Hoffman is on a bogey-free round and can go five under for both trips around Augusta this week with one more par. He has rattled off four pars in a row now as he moves onto 18 at 10 under. What odds would you have got on 10 under being four off the pace after 36 holes? Dustin Johnson five under, Paul Casey on the same mark, surely one of these can go on. Johnson has momentum, though she is a cruel mistress and can turn on a dime. The American has five feet for his par on hole nine - Carolina Cherry. Tiger Woods is on 'Holly' - the 18th. A birdie putt to move to three under dribbles away. He ends on two under but hats off to Tiger, it's a 69 for the day. Casey has 10 feet for par on seven, big putt, heart of the cup. Where is the eagle I just mentioned? It's on the 13th green and it is the very vocal Kevin Na. An immaculate approach on the par five drag gives him a right-to-left breaker of around 12 feet which he judges wonderfully. That is him on to four under. He does a little jig which quite frankly should be banned at Augusta. Rory McIlroy looks less and less likely to be wearing a Green Jacket on Sunday. The four-time major winner has 20 feet for par on the fifth and that does not even threaten the cup. Short and not on the right line. Bogey and back to even par. A heavy price for smashing his second strike too far. Ilonen is right on the line of the cut at three over and in severe danger of heading home early. Some big potential casualties out there. Justin Rose is having none of Paul Casey being ahead of him is he? Ninth green, the US Open winner has a long putt for birdie... it's in is it... ouch. That hurts, one roll away from a superb birdie. Rose will stay on four under. Dustin Johnson started with a double bogey remember, now he has a chance for a second eagle of the day. It's the eighth hole and around 15 feet. Never in doubt, drops below ground level into the cup. That is him onto five under and maybe the charger through the field we long for. Here is Tiger on the 18th tee. Hits it like a rocket, it sounds like a rocket off the club, perfect into the fairway. Scotland's Bradley Neil finished his first Masters on 13 over after adding a seven-over 79 to Thursday's 78. The 2014 Amateur champion, who played with 1988 winner Sandy Lyle, said: "I've prepared well for this but this shows it's not been enough. "You know how tough this place is before you get here but any expectations you have are blown out of the water. You don't realise how tough it is until you play it. You watch it so much on TV but you can't believe the difference. "I'm disappointed with the last two days, I've done worse here than I did at the Open (missing the cut on 11 over at Hoylake)." Tiger Woods has a very, very ling birdie putt on 17 for a birdie three... it snakes from the fringe of the green, rolls up, starts to take the left-to-right break and breaks too far. Now he has 10 feet uphill for par. Here he goes... the old Tiger Woods fist pump is with us ladies and gents. A nice save. Par, two under overall, 12 off the lead. Now then, what about Paul Casey for birdie on six? Another fist pump. The Englishman is five under, one ahead of compatriot Justin Rose. Ryan Matthew Grove: Sat in the garden, BBQ on the go, drink in hand, the Masters on my phone. Doesn't get much better! Adam Bailey: Any other year and Hoffman would be leading the Masters but Jordan Spieth is on another level at the moment. "I think Jordan Spieth had so much form coming in it is not a surprise to see him at the top of the leaderboard but Charley Hoffman is a surprise, he is essentially five shots ahead of everyone but Spieth. Hoffman is a really good solid player, very level headed." Spieth finished runner-up twice and won in the three tournaments he started before the Masters. Oh no Lefty. That is not how you start chopping at this lead. A hooked tee shot from Phil Mickelson on the par-three fourth finds sand, the chip is short, the putt is short, it's bogey. Back to one under, 13 off the pace. Now then, what for our prime chaser? Charley Hoffman wastes the par five 15th and only pars, but hang on... hang on... this tee shot is juicy and on 16 he has five feet for birdie. Here is Streelman on the 11th, a horribly long par four. "Right there", he says with his second shot in the air. It's solid into the heart of the green. A long putt but two will get him par and keep him three under. Jonas Blixt is one under and on the same hole... aggressive from a long way out and that's much better, 15 feet for birdie. Stephen Gallacher - of Scotland - is right on the cut line at +2 and plays it safe, middle of the dance floor. Dustin Johnson, Justin Rose, Kevin Streelman, Jason Day. What do they have in common? Three under. Can one of these rattle off a birdie-fest and get involved? BBC Sport's Ian Singleton at Augusta: "Augusta places a lot of stock on etiquette. As a result one of the constant sights of modern life is nowhere to be seen. Mobile phones are banned on the course and it is odd not to see people taking pictures, chatting or surfing the internet on them. "You won't find a selfie stick here. Or if you did that person would likely be ejected. This means the pay phone is alive and well: precisely 24 of them around the food stands and all in heavy use. The old school giant leaderboard is also must see with no phones to deliver live score updates." Now then, Kevin Na, who loves nothing more than an argument with his caddie, is stood on the par-3 12th tee. The right hander tees up, water before him, a front-green bunker. Oh, hello, he is asking his caddie to shout at someone to "shut something off". Apparently it was a leaf blower across on the 11th green. Here goes Na eventually... "down" shouts his caddie. This pair would do well on stage. He clears the green and will have a treacherous chip back with water beyond the green. The lowest score in Masters history at halfway belongs to Jordan Spieth. He - still 21 remember - cannot make birdie on 18 but his six-under round, added to eight under yesterday gives him an overall score of 130. That breaks Ray Floyd's record of 131 set in 1976. The clubhouse lead is 14 under par. Dear me. Where are the wannabes? The men who are looking at Jordan Spieth with envy. Rory McIlroy sinks a five footer on three to save par, that's him stuck on one under. And where has Tiger Woods gone? He is ticking along, causing far fewer headlines than we would like. Still two under through 15, three under for the day. We just had Kevin Na locked in debate with his caddie. "Unless you take this out of my hands I'm going to go with it." he says. "I can do it." He has a bang from the middle of the 11th fairway and gets the length he needs, too much in fact. Back of the green. Na is two under. He puts his third to within five feet. It looks like Jordan Spieth is about to make Masters history by setting the record for the halfway lead. He has a seven-foot putt for birdie on the 18th. Don't forget that from 21:00 BST, Mark Chapman presents live coverage from Augusta, which continues on 5 live sports extra from 22:00 BST. Two men going in opposite directions are Jason Day and Dustin Johnson. Day started the day at five under but has just three putted on the 14th hole from 18 feet and is now just two under having started three strokes better off. Dustin Johnson is up for a rollercoaster day. Double bogey on one but responds like a man on a mission with eagle on two, birdie on five. Back to three under. Is he our charger? So Jordan Spieth is one hole away from some history at the halfway stage, but remember it is not over until it is over. The 18th hole - named 'Holly' - is prickly to say the least. It is the third-toughest drag in the tournament this year so far. The par four has taken an average 4.31 strokes. It has given up just 15 birdies in one and-a-half days. Jordan Spieth saves par on 17, converting from two feet to stay 14 under and one more par gives him the Masters record at the halfway stage. Will that bother him? He may be more concerned with Charley Hoffman? The American, all in white, has just dropped a lovely 23-foot putt on 14 and that is birdie time - 10 under. Four back. At what point will the galleries start chanting "Charley, Charley". We need a battle for this Green Jacket. Thanks Ben. Right then, anyone else getting a bit angry with this dominance from Mr Spieth? We need a close-fought contest don't we? Can the coming hours change things? Danny Willet is lamping one into the par-five 13th hole. Heart of the green stuff and a full 20 feet for par as he has taken a drop there. Currently one under, work to do to stay in red numbers. It's taken McIlroy and Mickelson about 45 minutes to play the first two holes, which is just ridiculous. If you were stuck behind them at your local municipal, you'd have stuck a ball up their backsides by now or gone in for bacon sandwiches. McIlroy is back to one under though - a nine-footer on the second after escaping from a greenside bunker. Lorcan Moore: Has everyone forgotten about Rory in 2011. McIlroy finished day four in 2011 with an 80 to blow his lead. Spieth pars 16 to stay -14 and five clear. Trevor Immelman, champion in 2008, has endured an ugly week, rounds of 76 and 77 for the South African. It's as if someone has erected an invisible brick wall behind Spieth and Hoffman, everyone below them on the leaderboard rebounding off it. Dustin Johnson moves to three under with birdie at five. Schwartzel, just as he did yesterday, birdies two to get to two under. This tournament badly needs someone, anyone, to go out there this afternoon and shoot a 64, just so Spieth goes into the weekend with some hot breath on his neck. Hoffman doing his best - birdie at 13, he moves to -9 and five off the lead. It must be said, what Spieth is doing to this course hasn't been seen since Tiger Woods formally announced himself to the world in 1997. The 21-year-old is currently playing the par-three 16th. England's Paul Casey suddenly finds himself fourth without having to do much, he's four under after two. Looks like Garcia has had enough, another one gone at 13, he'll find himself struggling to make the weekend if he's not careful. Judging by that last putt, he's not being that careful. Here's Charley Hoffman, the only man in the field who has gone with Spieth today... solid shot into 13, he's got about 12 feet for birdie. Spieth is six clear of Charley Hoffman with no one else emerging from the pack to threaten. Is there someone who can do it? Tweet us on #bbcgolf. Which player can threaten to Spieth's lead? Dustin Johnson is a streaky old player, he kicked off with a double and followed that with an eagle to get back to two under. Another birdie for Spieth at 15. He played short of the water with his second on the par-five hole and nailed a wedge to eight feet before knocking in the putt. Simple golf and he is now 14 under and six clear of Hoffman. Hideki Matsuyama has eagled two to get to three under. Still only 23, Matsuyama was earmarked for great things as a teenager and still might achieve them. Mark O'Meara, champion in 1998, is in with the day's low round, 68 for three under overall and a tie for fifth. Kevin Na of the United States into the red with a birdie at eight, he's three under today. Here's Charley Hoffman, the only man within seven shots of Spieth, putting for birdie on 12... nailed it, gets to eight under and five off the lead. Hoffman, playing his second Masters, is bogey-free today. Rose has let another one go at the fourth, the chasing pack dropping like flies at the moment. Woods's birdie putt comes up short at 13 but he's one under round Amen Corner and two under overall. McIlroy has a 13-foot putt on the first for par. He laced his drive down the middle but hit a wayward second left of the green from only 143 yards. The world number one chipped on but could not hole out and is back to level par. Playing partner Phil Mickelson in for a regulation par. Woods was forced to lay up at 13 after hitting a tree off the tee, but Spieth showed previously that that's no barrier to making birdies at this hole. A club too short, he's got a monster putt for birdie. Here's Hoffman at the 12th and that's a doozy, he's got a 10-footer for birdie to get to eight under. Par for Spieth at 14, he stays 13 under but has a birdie - perhaps an eagle - chance at 15. Eight shots is the biggest 36-hole deficit a Masters winner has managed to overcome, or so I'm told. Poulter of England has birdied two and five, is one under par. There is always something slightly melancholic about watching Sergio Garcia in a major - he started the day four under, is now level after 11. Jason Day, too, is in reverse, the much-fancied Aussie bogeyed 11 to drop to -3. Woods has got a long old putt for birdie at 12... didn't hit it, it was bang on line as well. It's a second-round 69 for 2009 champion Angel Cabrera, the Argentine is two off the clubhouse lead on -3. Matthew Burnett: If anyone thinks Jordan Spieth can't be caught, you have not watched enough Masters, long long way to go. Tim Southon: Spieth is so in the zone. M Becker: His golf is leaving me 'Spiethless'. Ali Moore: Spieth may as well give Hamilton Tailoring Company of Cincinnati his jacket measurements now (They make the Green Jacket). Jordan Spieth is opening up a gap the size of Texas between him and the field. This is a charge to behold. If he does close out in the next couple of days his home state of Texas will have 13 Green Jackets, more than any other US state. Donaldson from just off the green at 12 and he's thinned it over the green and very nearly into Rae's Creek. Ernie Els in with a level-par 72 for five under overall and eight off the lead. He had a real rough trot in the middle of his round but managed to assert some control down the stretch. The second is yielding plenty of shots today and Adam Scott is the latest to make hay, his birdie moving him into the red. A 76 for 1988 champion Sandy Lyle and his hickory-shafted putter, his race is run. Tough baptism for Scottish amateur Bradley Neil, at 19 the youngest man in the field - a 79 today to go with his 78 yesterday, he won't be around this weekend. He will, however, remember this week for as long as he lives. Woods with a solid tee shot at 12. "Warnings among locals that forecast rain is coming in fast. Wind picking up. McIlroy teeing off in about 20 minutes. Ominous." Tiger stalks his ball, crouches down to take a better look, takes aim and curls it in to claim a birdie at 11 and get to -2. Woods looking in pretty good nick at the moment, that takes him into a tie for 13th. Shane Daly: If Spieth finishes 15 under by the end of day, he can afford to par Saturday and Sunday's rounds amd may still win it. Top golfing. Jeff Murray: Spieth uncatchable, except history teaches us never to count our chickens as the unexpected always seems to happen at Augusta! Stenson's second at 13 is a peach, as well it might be, it took him about 10 minutes to choose a club. Ernie Els has got eight feet for a birdie at 18, which would get him back to six under and one under for his round. Vote time, people. 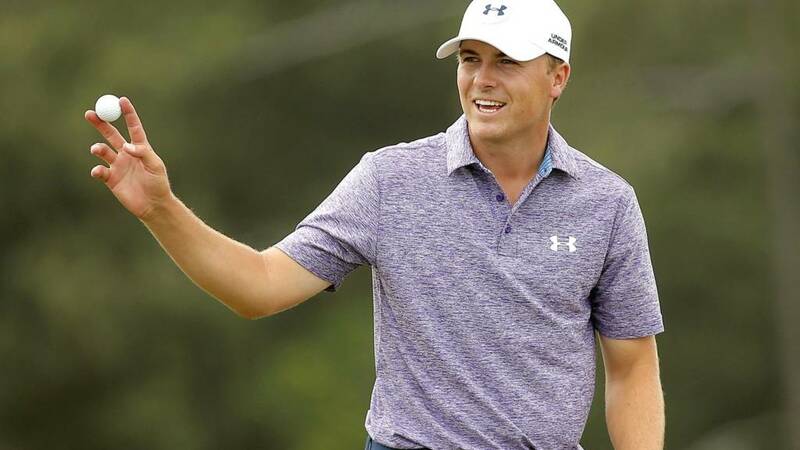 Do you think Jordan Spieth can be caught at the Masters? Cast your vote on the right of this page (desktop users) or via the 'vote' tab on mobiles and tablets. The vote closes at 20:00 BST with the result available soon after. Mark O'Meara, winner in 1998, is rolling back the years - birdie at 15, four under for the day and three under for the week. It's all gone wrong for Thongchai - the Thai was rocking and rolling on the outward nine but has just tripled the 11th to drop back to two over. What a ruddy nightmare. Spieth on tee at 13 and he's sprayed that right, although it looks good enough. Woods out in 34, it looks like the four-time champion will be around at the weekend, which is some feat given the amount of golf he's played of late. Spieth's birdie attempt at 12 misses by a whisker's whisker, he stays -12 and five clear of Hoffman. Westwood makes eagle at two, the Englishman is one under par. Wales's Jamie Donaldson also going well, he's out in 34 and level overall. Spieth has a makeable putt for birdie at the par-three 12th. Angel Cabrera likes it round Augusta, of that there is no doubt - the 2009 champion eagled 13, birdied 15 and is now two under. The burly Argentine could open a crystal glass museum in Cordoba, given the amount of eagles he's bagged round Augusta. McDowell drains a settling birdie at 12 to get back to +2 and just inside the projected cut line. Birdie for the punchy Patrick Reed at two, the 24-year-old from Texas is three under. Shot gone for Justin Rose at the first, drops to -4, winning his first Green Jacket just got a whole lot harder. The projected cut is hovering around two over par, occasionally stretching out to three over. Some Europeans are heading home by the looks of things. Thomas Bjorn (+7), Victor Dubuisson (+5) and Miguel Angel Jimenez (+6) are bang in trouble. Work to do for the likes of Luke Donaldo (+4), Padraig Harrington and Martin Kaymer are on the same mark. Lordy, lordy, Spieth very nearly holed that long-ranger from the fringe, he's got a one-incher for par. The kid from Dallas looking rock solid at the moment. Here's my first look at leader Jordan Spieth, coming up short at the 11th, but that's a straightforward up and down. Tiger Woods has birdied seven and eight, is into the red for the first time this week and tied for 16th. Garcia passing him in the other direction, he's made another bogey at seven, his third on the spin. The unheralded Kevin Streelman, winner of the par-three tournament this year, is three under after a birdie at one and two. Ian Woosnam, champion in 1991, is in with a creditable 74 for +5 overall. Alas, that probably won't be good enough for the weekend. A 67 will see Spieth around 36 holes in 131, the current record in a Masters set by Ray Floyd in 1976. That is 13 under. He is already 12 under. But a 66 sets a halfway record for all majors. Birdie for Els on 15, he's back where he started the day on five under par. Jason Day in freefall, he adds bogey at seven to bogey at six and is now four under and eight off the lead. England's Justin Rose is about to tee off, he's currently five under and six off the lead of Spieth. Make that seven, Spieth has just birdied 10 to get to 12 under and five clear of Charley Hoffman in second. Is it too early to ask - can Spieth be caught? Jason Day - no relation of Hollywood legend Doris - has let a shot go at six, the Aussie falls back to five under. Thongchai Jaidee of Thailand compiling one of the rounds of the day, he's three under through eight and back to level for the week. As it stands - and there is much golf to be played - the projected cut is +3. Not a great start from Northern Ireland's Graeme McDowell today, he's three over after nine and +2 for the tournament. Tiger Woods is back under par for the day, he follows bogey at six with birdie at seven and is level par overall. Garcia has hit a rut, another dropped shot at six, he's back to -2. Sweden's Henrik Stenson - Peter Alliss's pick, but isn't it always - has birdied eight and nine and is level for the week. Birdie for Oosthuizen at 13, he's back to three under and tied for seventh. Spieth must have missed that birdie chance at nine, but he's out in 33 and four clear of the chasing pack. Sergio Garcia has let a shot go at five to drop back to -3, Spieth has put in another spurt but he's not taking anyone with him at the moment. Bogey for Woods on the par-three sixth, he drops back to one over after an encouraging start. Better news for Tiger's old mate, the 58-year-old Mark O'Meara, who has just birdied 12 to get to two under and tied for 12th. Els gets back to four under par with a welcome birdie on 13. Former champion Mark O'Meara is two under through 11 today and he made a monster disappear at 11, alas for par. Brooks Koepka is three under through nine and one under for the week, the American bagged an eagle at eight. Shot gone for former Open champion Louis Oosthuizen on 12, he drops back to -2. Spieth made that birdie on eight, he's now -11 and five clear. Why: Short, but laced with danger. Guarded by Rae's Creek at front, sandtraps fore and aft. Minimal margin for error. Louis Oosthuizen drops his first shot of the round, returning to three under. A slap of the thigh from the South African on the 12th, too, as he screws his tee shot to the right. But he avoids the water hazard and should come away with a par. Steve, London: Spieth for the win. With the way he's playing, the likes of McIlroy, Watson and Mickelson might find themselves standing on the 1st 10 shots off the lead and having to cope with the worst of the weather. He could be out of sight before the weekend. Fred: Spieth effortlessly tearing up this Masters. Fascinating to watch! If only my maths integration was this intriguing. Freddie, Ilmington: Spieth showing what a young Tiger used to do. Tiger turning it up now. What do they say? Class is permanent or something like that.